Shares of electric carmaker Tesla Inc. fell more than 6 percent early Friday after the company's accounting chief left after just a month on the job -- and after CEO Elon Musk appeared to smoke marijuana during an interview. Musk appeared on "The Joe Rogan Experience" overnight. About two hours into the podcast, which can be seen on YouTube, Musk inhales from what the host says is a combined marijuana-tobacco joint, which Rogan notes is legal. "You probably can't because of stockholders, right?" 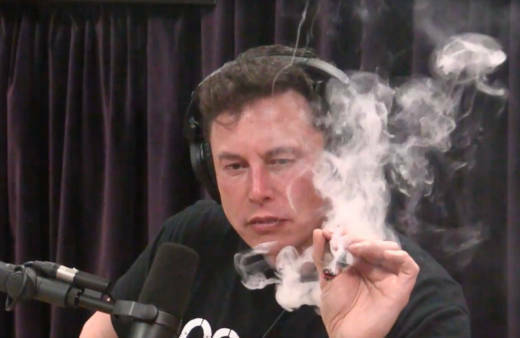 Rogan says, before passing the blunt to Musk, who also takes a sip of whiskey. As the video gained traction, more news hit. Early Friday, the Palo Alto-based company announced that Chief Accounting Officer Dave Morton resigned after a month on the job, citing public attention and the fast pace of the post. "Since I joined Tesla on August 6th, the level of public attention placed on the company, as well as the pace within the company, have exceeded my expectations," the company quoted Morton as saying in the filing with the U.S. Securities and Exchange Commission. "As a result, this caused me to reconsider my future. I want to be clear that I believe strongly in Tesla, its mission, and its future prospects, and I have no disagreements with Tesla's leadership or its financial reporting," Morton was quoted as saying. Moody's Investor Service downgraded Tesla's debt into junk territory in March, warning that Tesla won't have cash to cover $3.7 billion for normal operations, capital expenses and debt that comes due early next year. Tesla said cash from Model 3 sales will pay the bills and drive profits.